In previous posts, I wrote about the challenges of managing up, managing out, and managing down. Today, I will focus on the unique challenges posed by managing up. Whether you are in the C-suite, or in your first management position, you answer to someone. Your authority and autonomy come with limits. You need to influence your boss, the board of directors, or your company’s investors. 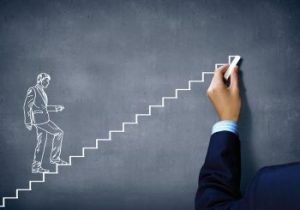 Now factor in the lack of career training and development typically offered by companies to new supervisors and C-suite executives. It is no wonder then that professionals struggle to figure out how to manage up effectively. Communicating with executive management or a board of directors (managing up) takes a different thought process and set of communication skills than influencing peers (managing out). Take the story of Sally, who was promoted to chief marketing officer. The role offered exciting opportunities and a new set of challenges. Sally had to learn about the challenges faced by the CFO, VP of IT, and VP of Human Resources. With help from an executive coach and professional development activities, she learned to think more strategically and how to read a profit-and-loss sheet. In addition, Sally spent more time reporting results directly to the CEO. For the first time, she was a participant in the company’s annual retreat. There, she learned more about the CEO’s long-term vision and potential threats and opportunities impacting the company’s growth. Based on her new understanding of how upper management operated, she was able to present solutions that made business sense to the CEO. Armed with a more strategic perspective, and having gained insight into her evolving role and industry, Sally began to manage up more effectively. She leveraged her newfound knowledge and began to lead her team in alignment with the CEO’s key objectives. She learned effective delegation and boosted her team’s productivity. Her ability to develop employees meant the team was prepared to succeed Sally when she moved on from the company. Like many of us, Sally had to create her own road map. Managing Up: What’s Your Plan? The first step in building a professional road map is determining where you want to go. If you are a company owner or CEO, this may also include determining the strategy for your company’s long-term future. Whether you are in charge of building teams, influencing a healthy and productive workplace culture, or determining the financial success of your company, first clarify how you define success. A quote by Sun Tzu, the Chinese military strategist, applies here: “Strategy without tactics is the slowest route to victory. Tactics without strategy is the noise before defeat.” If you are struggling with getting to the next level, it could be because you have not clearly defined your picture of success.